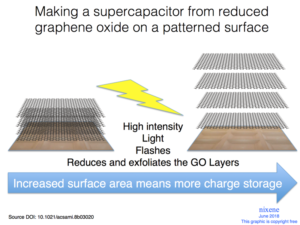 Why be interested in graphene? Who wouldn’t want to be interested in this, it is going to be revolutionary. A new material, isolated in 2004, it is the strongest material ever measured, transparent, flexible, conducts electricity and heat better than copper and has the highest melting point. The uses for this stuff will be endless. Now is a good time to be interested too. 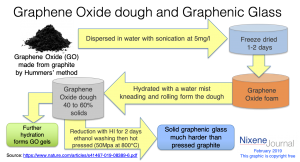 Graphene is starting to come out of the laboratory and find practical real-world applications. It is already being used to give elite sports competitors and edge with graphene enhanced running shoes, rubber tyres for bikes that grip better and give faster lap times. Graphene is even making a discreet involvement in racing cars where it can make carbon fibre components stronger and lighter. Graphene inks are being used to create electrically conductive patterns on textiles and other flexible materials; the smart clothing of the future will contain graphene. Expect to hear of graphene in construction. It makes concrete stronger, It can even make concrete electrically conductive giving us roads and floors with built in heating and no wiring that can fail. Graphene has a sister material, graphene oxide. The latest research shows that human cells can grow over graphene oxide scaffolds. This opens up the possibility to make new parts for our bodies. Even more exciting is the discovery that human nerve cells will regrow along guides made from graphene oxide. And that is just the tip of the iceberg, see what I mean? 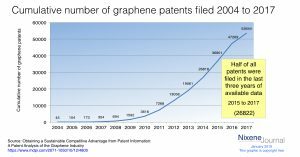 Who wouldn’t want to be interested in graphene?